The Generals series has quickly become one of my favorite series of biographies, mainly because of the carefully thought out books and well-written material. Though Sherman: Ruthless Victor, by Agostino Von Hassell and Ed Breslin, is of the same literary quality as its brethren, the man behind the book is not of an equal calibre with the others in the series. This book is slightly shorter than others in the series, but is written extremely well and is generally interesting and intriguing. Where I was disappointed, however, is in the figure of Sherman himself. This book portrays a moody, bad-tempered, and perhaps even insane military leader whose cruelty on the battlefield is what brought him fame. Overall, it left me with a very negative opinion of Sherman and a feeling of having wasted several hours learning about this man’s life. Sherman lost his father at nine years old, and henceforth had little contact with his mother. He was brought up by his foster father Thomas Ewing, an influential man whose shadow Sherman was constantly trying to move away from. His life was marked by a series of initial failures, including a lackluster initial military career, a failure in the banking industry, and a failure as a lawyer. Particularly interesting was Sherman’s contradictory lifestyle. Two examples spring to mind: one, wanting to escape from the influential shadow of his foster father, yet marrying his daughter, and two, being proslavery with an unwavering dedication to preserving the Union. These are simply two examples of major contradictions in Sherman’s personal life that were later echoed on the battlefield. The Civil War took Sherman from his teaching position in Louisiana, and brought him back to military service. Again through the considerable influence of his father-in-law’s family, Sherman was given a promotion to Brigadier General after his leadership at the Battle of Bull Run, and later, after a mental collapse in Kentucky, given a position under General Grant in the western theater. 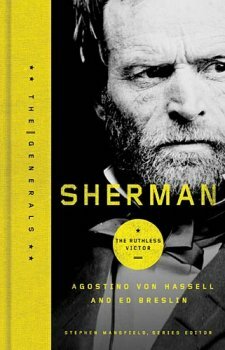 Once in the Civil War, the book seems to run out of any monumental acts Sherman may have done. His only triumph through these five years are the Battle of Shiloh and his famous March to the Sea. Throughout the war, the book paints a picture of a moody and angry man who did not deserve the recognition he received. Especially interesting to me was Ulysses Grant’s loyalty to Sherman, even when Sherman privately grumbled at Grant’s decisions. The section on his March to the Sea tells us of a ruthless general who destroyed large swaths of the South even when he was facing little or no resistance from the Confederates: a concept now known as total war. Overall, this was a disappointing read. Though I still hold The Generals in high esteem as a series overall, this individual book was somewhat disappointing. You’re better off spending your time reading about Lee or Grant. I must say, however, that the writers of this book were fantastic, faced with the difficult problem of writing a book on a man who did not lead a great life, despite what history says to the opposite. I enjoyed reading your review, but I do have a question: just because a biography is about a dislikeable person, does that mean we shouldn’t read it? It seems to me that such biographies may still be profitable and educational, even if the reader doesn’t particularly care for the person in question. As I was reading your review, I found myself thinking the same thing that Corey expressed above. Getting at the truth about a historical figure who may have an undeserved aura of greatness can be a great reminder of the fact that things are not always what they seem, and there is One who judges justly and will declare true greatness and deserved honor from that which is false and undeserved. Perhaps, even though you were disappointed, you may have learned more from Sherman’s life than you realized.